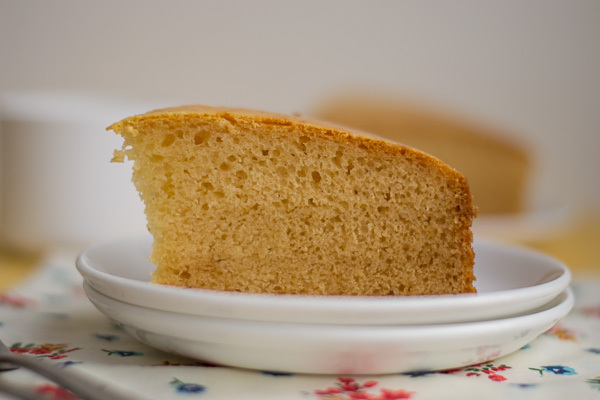 Simple Eggless Vanilla Sponge Cake Recipe – Very Soft and Moist. 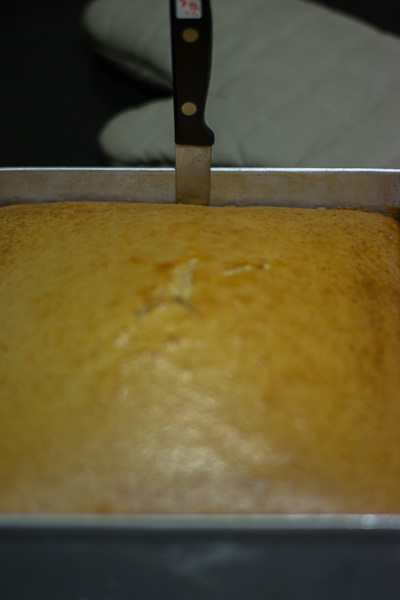 How to make Basic Eggless Vanilla Sponge Cake Recipe. Very soft, moist, tender and fluffy. Best plain vanilla base cake recipe. With step by step pictures. 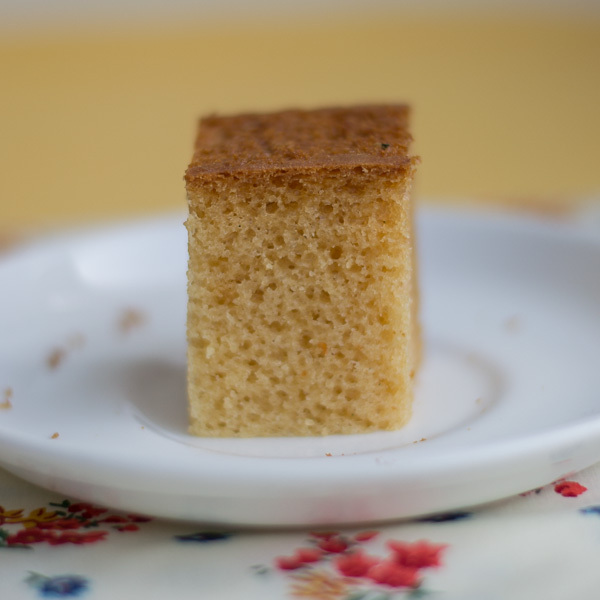 This is a very simple Eggless Vanilla Sponge Cake and delicious recipe. Egg-less cakes can be tricky as they usually turn out dry and dense and crumble easily. But this one is a winner. This cake is very soft, moist, tender and fluffy. It makes an absolutely nice base cake that one can use for layer cakes. 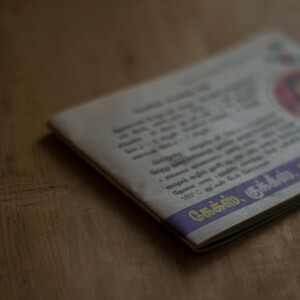 My mom had given me a small and tiny recipe snippet book on baking years back. I found this gem of a recipe in that book. Many of you have requested that I post a good egg-less cake recipe. I am happy to oblige. Lets jump straight into the recipe. Here you go! Preheat the oven to 350 degrees F / 180 degrees Celsius. 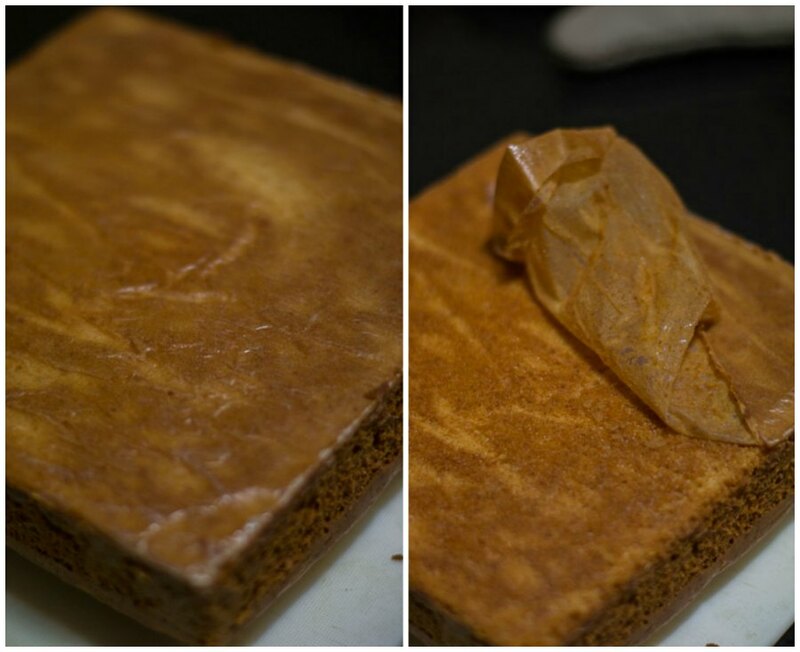 Line an 8 inch square pan with butter paper or parchment. Grease and flour the pan. Set aside. We need to cream butter and sugar. Sift 60 grams of confectioners sugar and set aside. We need to sift the sugar to get rid of any lumps. Let the butter be at room temperature. 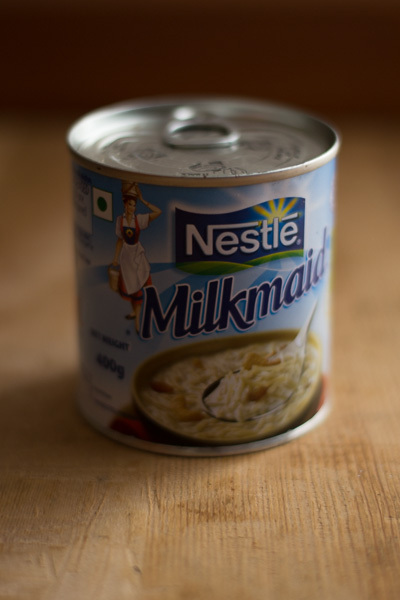 Its time for that delicious ingredient called milkmaid. Its nothing but condensed milk. I lick the can almost every single time I use it. I know you do it too. 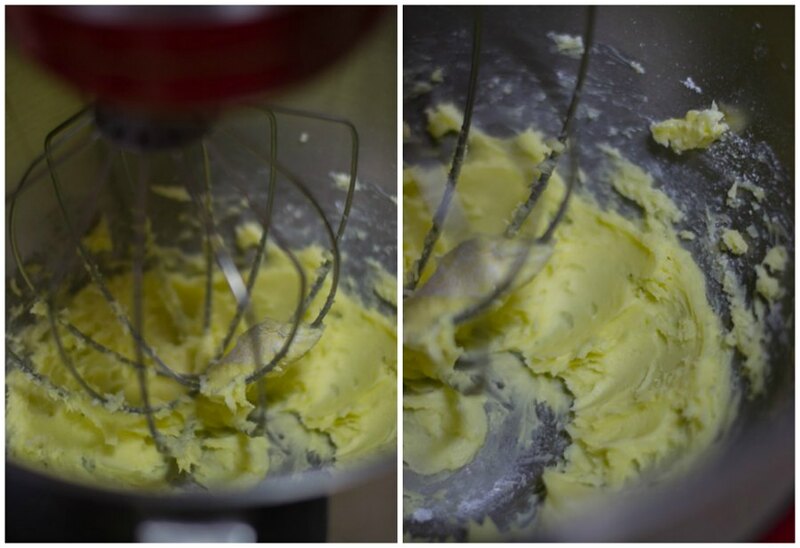 Add in a teaspoon of real vanilla extract and one whole can/tin of milkmaid to the creamed butter sugar mixture. Beat well for a couple of minutes. Lets now measure the flour and the raising agents. We will need one level teaspoon of baking soda and two level teaspoon of baking powder. 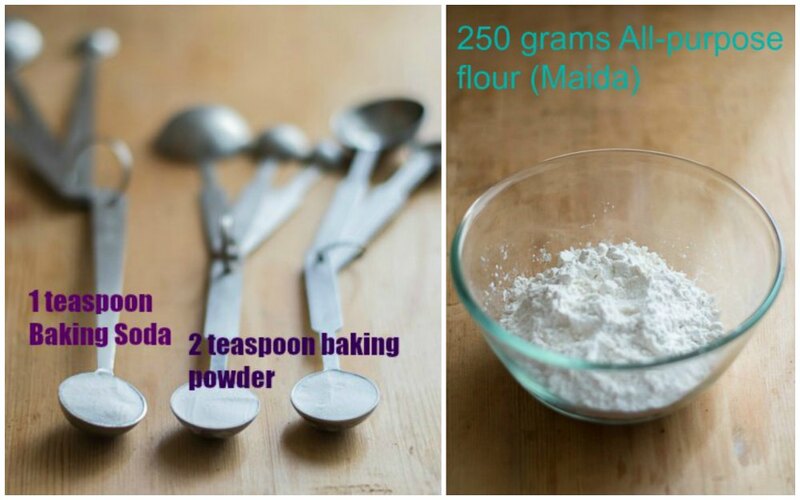 Sift the ingredients to remove any lumps in the flour and to distribute the raising agents uniformly in the mixture. Add in the sifted flour mixture slowly until a thick batter is formed. Measure 1.5 cups of milk. 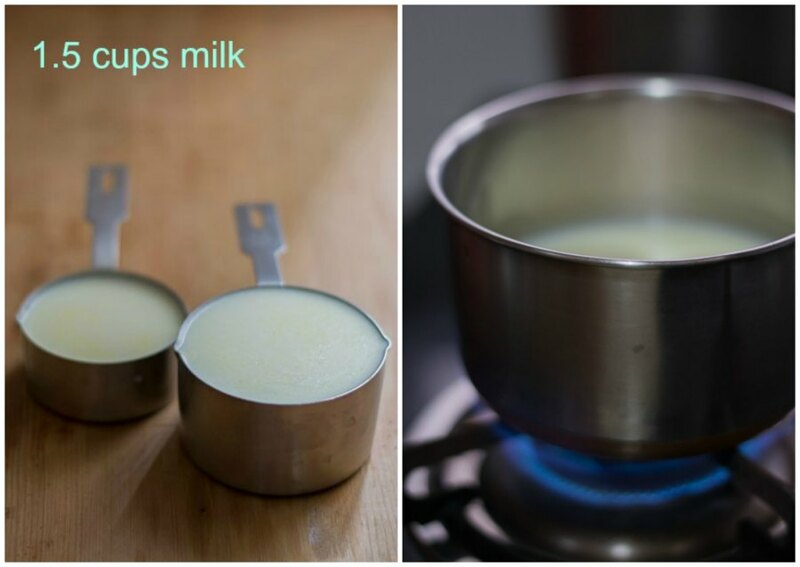 Heat the milk until its hot but not boiling. 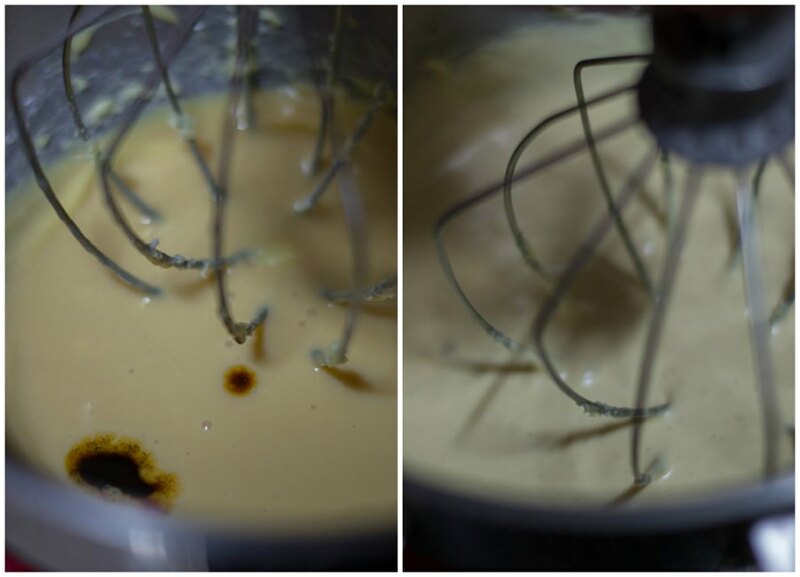 Add the hot milk to the batter and mix well to combine. Pour it in a 8 by 8 square pan. Bake it immediately in a preheated 350 degree F oven for about 50-60 minutes or until a toothpick inserted in the middle comes clean. Do not open the oven for the first 30 minutes of baking. If you open, the heat will escape and the middle of the cake will sink. Cool on a wire rack for 10 minutes. Run a knife on the edges of the pan to ensure smooth release. Turn the pan upside down and gently release the pan. 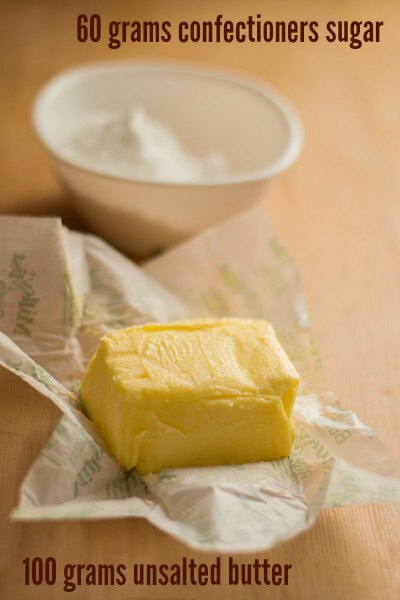 Remove the butter paper/parchment. Invert the cake and cool the cake completely. Store in an airtight container in the refrigerator for up-to two days. How to make Basic Eggless Vanilla Sponge Cake Recipe. Very soft, moist, tender and fluffy. Best plain vanilla base cake recipe. Sift the dry ingredients to remove any lumps in the flour and to distribute the raising agents uniformly in the mixture. 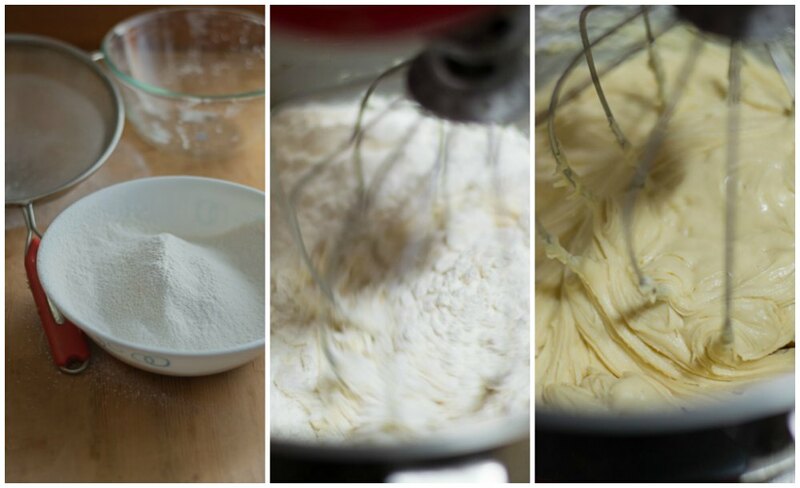 Add in the sifted flour mixture slowly until a thick batter is formed. Measure 1.5 cups of milk. Heat the milk until its hot but not boiling. 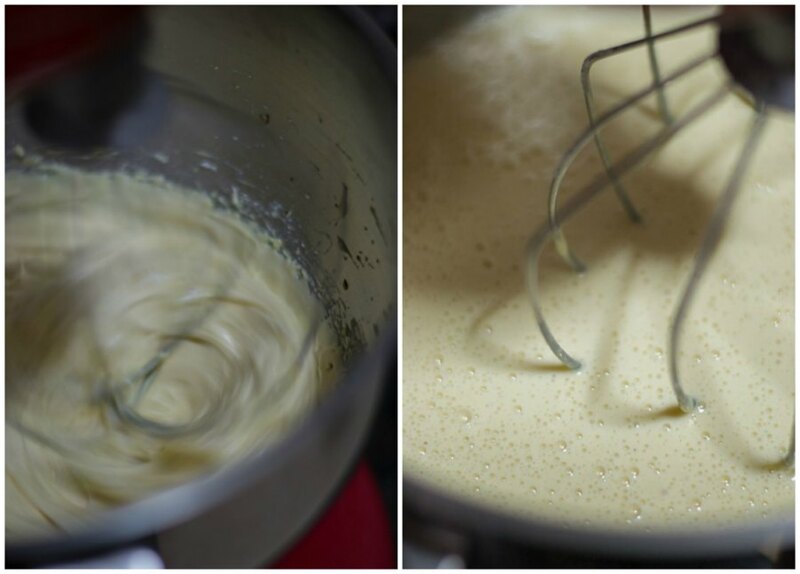 Add the hot milk to the batter and mix well to combine. Pour it in a 8 by 8 square pan and bake it immediately in a preheated 350 degree F oven for about 50-60 minutes or until a toothpick inserted in the middle comes clean. Do not open the oven for the first 30 minutes of baking. Im planning to buy a blender. Could you advise which one is best to buy in the US.? This is really a life saver for me. I had an eggless cake order and I tried or follow the recipe which I was already suggested by my tutor. I used curd instead of milk mais for the first time and it turned out to be a disaster. It tasted sour. Then I was searching for a better substitute for curd and good recipe in the net. I found your recipe. 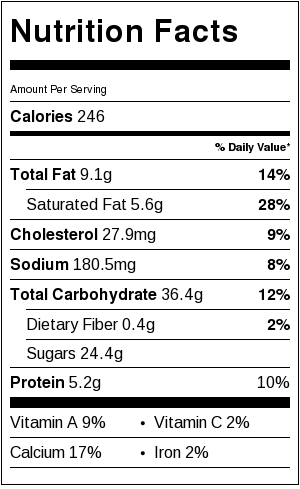 I usually like to measure the ingredients in grams. But many of the recipe gave in cups form. Only your I could see with grams. I followed completely whatever you’ve mentioned in this recipe and found my first eggless cake was a hit. Thank you for the wonderful instructions and the recipe. I sold it and got a good feedbacks too. Thank you so much and hereafter this would be my recipe for eggless sponge cake. Can u please suggested vanilla cake receipe in pressure cooker. HI I SAY THIS WITHOUT DISRESPECT AFTER READING ALL THE COMMENTS I THOUGHT THIS WAS THE EGGLESS RECIPE I HAVE BEEN LOOKING FOR BUT I HAVE TO SAY I FOLLOWED YOUR INSTRUCTIONS TO A “T” USED TOP QUALITY INGREDIENTS BUT THE SMELL AFTER ADDING THE HOT MILK, DURING BAKING AND AFTER IT FULLY BAKED WAS ABSOLUTELY DISGUSTING IT HAD THIS HORRIBLE FISHY SMELL THAT IT TOTALLY PUT YOU OFF I HAD TO THROW IT OUT AS IT WAS MAKING YOU SICK, THE OTHER STAFF IN THE KITCHEN ASKED WHAT IS THAT HORRIBLE SMELL WHAT ARE YOU COOKING? I DONT KNOW WHY AND HOW THE OTHER COMMENTS HAVE HAD NO ISSUES WITH THIS RECIPE, I HAVE COOKED OTHER EGGLESS RECIPIES WITHOUT ISSUES NEVER HAD THIS HORRIBLE SMELL IN BAKING SWEETS. IF YOU OR ANY OTHER READERS CAN SHED SOME LIGHT PLEASE LET ME KNOW. SORRY BUT I CANNOT GIVE THIS RECIPE ANY RATING. Hi Kannamma, tried your Eggless Vanilla Cake recipe, it was a huge hit..thanks a lot.have been baking cakes with eggs but was very doubtful of the sponginess n moistness but I guess now I have the confidence to bake more eggless cakes after going through your blog and trying your recipe..thanks a lot for sharing. We baked the cake precisely following the recipe and it turned out fluffy, spongy and very tasty. We used and 8 by 8 inch pan that was 1 1/2 inch deep and the cake rose a lot! It started to curve like a dome, and so I would suggest a deeper pan. Otherwise, GREAT RECIPE!!! Thanks for sharing it. Got it in very 1st time. Delicious. Thanks for sharing. i will try to make and let u know the outcome. Sure. Do let us know! Awesome…i tried this with my own variations and it tastes sooooo nice ??? recipe thanks for sharing it. Hi… Why you add warm milk is there any reason. Thanks.mam.but I poor noledge in English.so I want in Telugu. 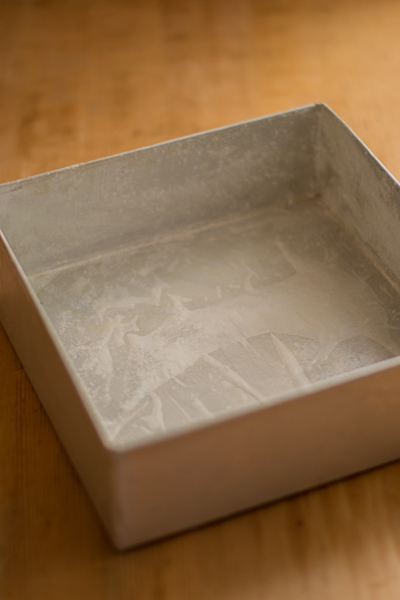 Is this recipe suitable for 8×12×3 SHEET Cake pan? Or should I double the recipe for that? This is how I calculate to see If a recipe can be accommodated for different size pans. The area of an 8 inch circle is pi*R*R 3.14*4*4 = 50.56. We use 2 * 8 inch pans. So the area would be roughly around 100. lets say. The area of an 10 inch circle is pi*R*R 3.14*5*5 = 78.5. SO the batter would overflow in one 10 inch pan. Thanks kannama. Yeah the recipe was frm sone other url. Oh ok. That was the first time ever i tried a cake. As u said i will have to search n try for a whole wheat cake alone. I din kno that it would affect d end product. I jus simply replaced maida with wheat as v r not using maida over 15 years. Thanks a lot kannama. Can u share a whole wheat cake recipe definitely egg less???? Sure Deepa. Will share a whole wheat cake soon. 15 years of no Maida????? You are superb man! I am not sure if this recipe is from Kannamma Cooks. My general advice would be to not change ingredients while baking. There are a lot of whole wheat cake recipes. Do not substitute atta when maida is called for. The liquid proportion for maida and atta vary and will not work well if blindly substituted. Nice recipe. I am planning to make this cake for my sister who does not eat eggs. Should I use full-fat milk? Or can 2% milk be used? Does the fat content in milk affect how soft the cake turns out. Thanks a lot for this wonderful compilation of recipes and tips. It has been immensely helpful. Hi Hema, You can use 2% milk. But Full fat milk gives more flavour and taste. Thanks! One more question – can I use a loaf pan? Would that affect the recipe? I would advise not to go higher than a 2 inch deep pan. Thank you so much Suguna! The cake has come out beautifully. Went all out and used full fat milk. Delicious!! Can this be adapted for a chocolate flavor? Hi kannamma, can i substitute butter for ghee? Because i find lumps forming when i cream solid butter and sugar together. Also, if ghee can be substituted for butter, how much ghee to add? Thanks. Hi Vidhya, use room temp butter and you should be fine. I would not use ghee for this recipe. Have been “trolling” for a recipe w/o egg for baby’s 1st Bday cake…this is it! All my questions have been answered where I had a concern…going thru’ the queries makes me wonder sometimes why people just don’t pay attention !? You are a very nice, patient person ? I’m baking this cake in two different containers as the end result will be a “Barn Owl” and the body will have to be “molded” out of two Seperate cakes. I plan on using two 1 qt size containers to bake….won’t fill to capacity. I’ll use left over, if any, for a cupcake or two, I’m excited to get going on it this Friday. Thanks Geraldine. Let me know how the cake turns out. Happy Birthday to your baby! Hi there, can this recipe also be used in a 8″ round baking tin? Can you tell me the amount of Milk in liters? cups will be different shapes with all of us..
A standard US cup is approx about 240 ml. You can get measuring cups in supermarkets these days! I have never used oil for this recipe as it involves the creaming technique. Just wanted to check whether butter can be replaced by oil as butter cake tends to get hard when kept in fridge after icing,if ys what should be the quantity. Please go through the comments section. Its been mentioned. I tried this recipe but the upper layer of the cake got burnt and inside, it didn’t get baked well. Should I be reducing the temperature? I have an eggless birthday cake to make (covered with fondant and decorated) – would this recipe hold up to being covered in fondant? I think I might times and a half it for extra height or do these ingredients x 2 maybe? I have never tried this recipe for making tall cakes. I don’t understand the second part of your question? Can you tell me once again? Try doubling the ingredients if you want a 2 or 3 layered cake. If not this will do for a small one. Your cake recipe was beautiful. Thanks for sharing. Thanks Annabella. Really glad that you like it. I have tried a few of your recipes, I especially love the vanilla sponge cane with egg and my all time favourite, the tea recipe, today I tried this eggless cake recipe, and simply loved the results, though for some reason my cake was baked in just 35 minutes, it came out well baked, fluffy, soft and delicious. Do you think the fact that I divided the batter in equal amount and baked in two moulds has someting to do with the cake getting baked earlier than mentioned ? I followed the recipe to the T. Used a scale for measuring all the ingredients. Yes Akershika. You are right, when you reduce the batter, the cake cooks fast. really happy that you have tried the recipes and like it. Dum tea is my favorite too! suche a breeze isnt it? Hey seems nice recipe ,want to give it a try,i m just confused can that milk maid be replaced by condense milk? Yes. Condensed milk is what it is. 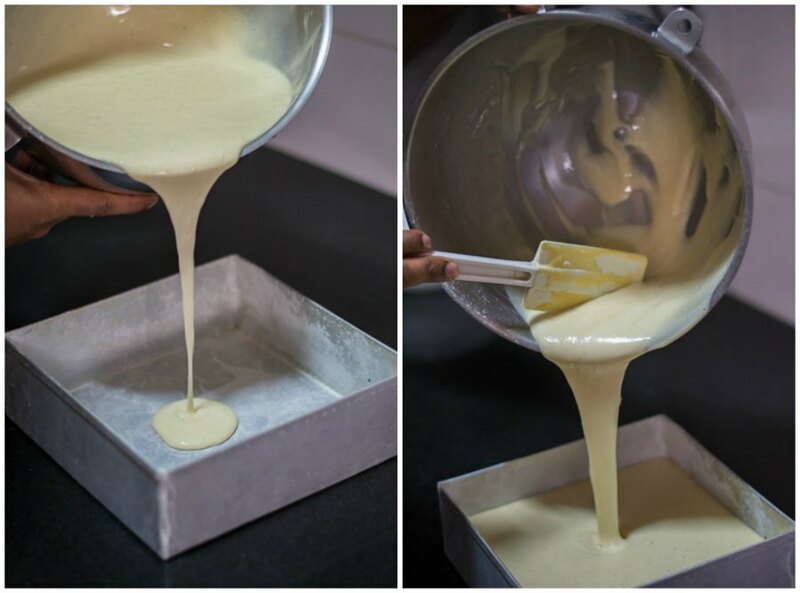 Your cake recipe is very simple yet tasty… Loved the taste. Thanks for sharing.. I trier tour recipe today by taste ans texture sise it was awsome. Thann you. But thé outre layer of thé cake came too crisp and brownish. So telle me thé reason? You can try covering with a foil on top to avoid over browning. You can also use cake strips. I today did youryour cake it came vert well un taste and structure. Thann you very much. but thé outre layer became too Brown and crisp. give me dôme tips on it. you need to use real vanilla. I just made my first cake with ur recipe and it was to my surprise as a new baker became a delicious sponge cake and I was feeling like a pro… All credits goes to you… Thanks for d real good recipe !! Thats wow! Silviya. A virtual hi5 to you! Can you please give me a cake recipe that is moist and soft, where I don’t have to use butter, please? A recipe in which I can use sunflower or canola oil. It can be a plain cake, sponge or pound cake, either baked in a tin or cupcake. The recipe will be greatly appreciated. Thank you. hai,i am using morphy richards otg, when i’ll bake a cake it will become hard ontop and sticky in the middle. please sed me some tips to make it perfectly. I have never worked with Murphy Richards OTG unfortunately Kavitha. Hello .. m hema.. newbie to baking.. I want to knw if the procedure is same for halogen oven.. d cake gets burnt at d top and will b vry soggy in d centre.. pls advice me..
Hi Hema, I have never baked a cake in halogen oven. OTG is always better. I tried this recipe today…and it turned out very well.. The cake was very spongy and tasty. I tried it in cooker, but the duration for baking must be 30 mins only. I left for 40 mins..and I got the cake burnt on sides and bottom. Thats good to know Vasna. Did you measure the ingredients using a scale? Proper measurements are key for this recipe. Hi, the recipe looks simple. Thanks for sharing. I’m running out of baking powder at the moment. Instead can I use baking soda only? If yes, how many teaspoons? Or else can I add a tablespoon of lime juice to get the raising effect? What u recon? Thanks v much in advance. Hi Gajee, You cannot substitute baking powder and baking soda just like that. It wont work. Please use as instructed in the recipe. Hi .. I just tried your recipe and the taste was good. It was also very soft like a sponge.. The only thing that was strange is that my cake was brown from the inside and not yellowish. What did i do wrong? ?? Hi Maya, because this cake is made with condensed milk, it caramelizes when cooking and the cake colour turns light brown. I feel you did not go wrong anywhere. I just tried this recipe. I didn’t have an 8×8 so just used my mil’s deep oval Pyrex dish. While baking, the cake rose so well, I was truly impressed. After cooling, however, it deflated and when I cut it, I saw it had only baked half way through. The bottom half is dense and pasty. I’m always baking but it’s been a while since I tried a condensed-milk based recipe. I wanted something that would give me some height but this one somehow failed me. I followed the recipe to the T though, wonder what went wrong?! Tastes amazing though!! Hi Sab. I am truly sorry that the cake dint give you the desired results. This is a very fool proof recipe. Looks like the cake was underbaked or too much batter for the pan. Did the cake brown well? Did you cook for 50-60 minutes? Hi i tried this recipe today. The center came out very dense. What do you think went wrong ? Hi Neha, Can you explain a bit more as to what you did, how you measured etc?? Hello Kanamma, can i adapt the same recipe for chocolate sponge? By replacing a half cup of flour with cocoa powder? Hi Shardha. I have not tried it with substituting cocoa. But I think it should work. Can u give ur cup measures I in ml? Its already given in the recipe Diya. I have given both the measurements. 1 cup = 250 ml. If that is what you are looking for. Hope this helps. Hi Saguna, your recipe is looks so good and yummy. I’m just confused of milkmaid. What is milkmaid? Hi Stef, Milkmaid is condensed milk. Hi Saguna, loved your recipe. Will definitely try it out. Just one query…… What is confectioners sugar? Is it the regular granulated sugar in powder form? Hi Ashwini, I have never tried this recipe in a cooker. So I may not know. Thanks for stopping by. I tried in cooker..with sand at the bottom. Make sure the baking time is 30 mins on low flame.